Climate effects on hydrology impart high variability to water-quality properties, including nutrient loadings, concentrations, and phytoplankton biomass as chlorophyll-a (chl-a), in estuarine and coastal ecosystems. Resolving long-term trends of these properties requires that we distinguish climate effects from secular changes reflecting anthropogenic eutrophication. Here, we test the hypothesis that strong climatic contrasts leading to irregular dry and wet periods contribute significantly to interannual variability of mean annual values of water-quality properties using in situ data for Chesapeake Bay. Climate effects are quantified using annual freshwater discharge from the Susquehanna River together with a synoptic climatology for the Chesapeake Bay region based on predominant sea-level pressure patterns. Time series of water-quality properties are analyzed using historical (1945–1983) and recent (1984–2012) data for the bay adjusted for climate effects on hydrology. Contemporary monitoring by the Chesapeake Bay Program (CBP) provides data for a period since mid-1984 that is significantly impacted by anthropogenic eutrophication, while historical data back to 1945 serve as historical context for a period prior to severe impairments. The generalized additive model (GAM) and the generalized additive mixed model (GAMM) are developed for nutrient loadings and concentrations (total nitrogen—TN, nitrate + nitrate—NO2 + NO3) at the Susquehanna River and water-quality properties in the bay proper, including dissolved nutrients (NO2 + NO3, orthophosphate—PO4), chl-a, diffuse light attenuation coefficient (K D (PAR)), and chl-a/TN. Each statistical model consists of a sum of nonlinear functions to generate flow-adjusted time series and compute long-term trends accounting for climate effects on hydrology. We present results identifying successive periods of (1) eutrophication ca. 1945–1980 characterized by approximately doubled TN and NO2 + NO3 loadings, leading to increased chl-a and associated ecosystem impairments, and (2) modest decreases of TN and NO2 + NO3 loadings from 1981 to 2012, signaling a partial reversal of nutrient over-enrichment. 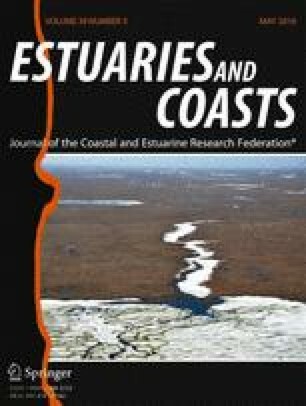 Comparison of our findings with long-term trends of water-quality properties for a variety of estuarine and coastal ecosystems around the world reveals that trends for Chesapeake Bay are weaker than for other systems subject to strenuous management efforts, suggesting that more aggressive actions than those undertaken to date will be required to counter anthropogenic eutrophication of this valuable resource. Our thanks to Dr. Jim Hagy of the EPA Gulf Breeze Laboratory for providing data from his Ph.D. Dissertation and to Dr. Bob Hirsch and his colleagues at the US Geological Survey for providing data on nutrient concentrations and loadings from the Nontidal Monitoring Program. Rich Batiuk and Gary Shenk of the EPA Chesapeake Bay Program provided point-source nutrient estimates and helpful comments on the manuscript. Detailed comments and suggestions by two anonymous reviewers significantly improved the manuscript. LWH was supported by the NSF Biological Oceanography Program and the NOAA Chesapeake Bay Program Office. HWP was supported by the NSF Biological Oceanography Program, the North Carolina Department of Environment and Natural Resources, ModMon and FerryMon Projects, and the Strategic Environmental Defense and Development Program (SERDP) of the Department of Defense. Jassby, A.D., and J.E. Cloern. 2014. wq: some tools for exploring water quality monitoring data. R package version 0.4-1. http://cran.r-project.org/package=wq. Moyer, D.L., RM. Hirsch, and K.E. Hyer. 2012. Comparison of two regression-based approaches for determining nutrient and sediment fluxes and trends in the Chesapeake Bay watershed. U.S. Geological Survey Scientific Investigations Report 2012–5244, 118 p. (http://pubs.usgs.gov/sir/2012/5244/).